Benefits of lemon and lime on health may be availed in both summer and winter. Lime is one of the most common fruits used across the world. Limes and lemons are mostly used interchangeably but they are 2 distinct species. Limes are usually smaller than lemons with lime juice having a strong flavor and more acidic than lemon juice. But essentially they have the same nutrients. Vitamin C powerhouse: The most important benefits of lemon and lime is attributed due to its vitamin C content. Vitamin C is extremely essential for a strong immune system. Both lemon and lime are a moderately good source of vitamin C, with lemons containing about one-third more vitamin C than limes. 100 gm of lemon (without peel) can provide 88 percent of the daily recommended value of vitamin C. A glass of warm water with lime/lemon juice and a teaspoonful of honey is an ideal remedy to keep yourself cold and cough free. Good for stomach: Lemon/lime juice aids the digestion process hence should be had after a heavy meal. You can also add a few lemon drops on your dish to aid digestion. But, remember that lemon does not go well with milk. Having lemon juice in water is also an ideal remedy if someone is suffering from bilious vomiting, indigestion and burning. The acids in lemons/limes are also good for flushing out the toxins from the bowel tracts that keeps constipation at bay. Helps maintain normal blood pressure: Lime juice is a good source of potassium which is important for regulating the heart rhythm and keeping the blood vessels relaxed thus reducing the risk of hypertension. Anti cancer properties: Citrus fruits, including lemons and limes, contain compounds called limonoids that have been shown to help fight cancers of the stomach, lungs, breast, skin and colon in animal studies and laboratory tests with human cells. Lemons and limes are a good source of a very long-acting limonoid called limonin, which can readily absorbed and utilized by our bodies. Scientists found traces of limonin in the body even 24 hours after consumption, where as natural anti-carcinogens present in other food items were found to be active for just 4 to 6 hours; for example, phenols in green tea. Weight loss: You know this most common benefits of lemon and lime and probably you have tried it as well. Yes! lemon water and honey first thing in the morning. It is an excellent fat burner as well as a brilliant refresher and antioxidant drink. Beneficial for hair: Ever wondered why shampoo advertisements stress on the fact that their product has lemon extracts. That is because it is very effective against dandruff. Lemon juice if applied on the scalp can treat problems like dandruff, hair fall and other problems related to hair and scalp. Gum problems: A deficiency of Vitamin C causes a lot of gum diseases (like scurvy which is characterized by swollen and bleeding gums). Regular consumption of lemons and limes, in some form or another, is a brilliant way to keep gum diseases at bay. 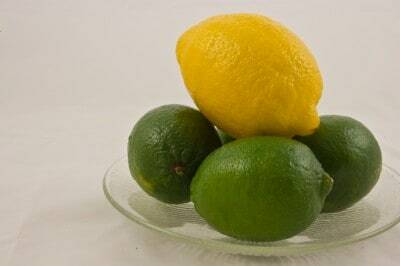 Benefits of lemon and lime on skin: Lime juice has been used as a bleaching agent for centuries. The antioxidant, antibiotic and disinfectant properties of lime helps rejuvenate the skin and protect it from infections. Lemon peels when rubbed on dry or scaly skin, moisturize the skin, making it soft and supple. Daily consumption of lemon water can make a huge difference in the appearance of your skin. It acts as an anti-aging remedy and can remove wrinkles and blackheads. Cholera: Another benefits of Lemon and lime is that they contain many flavonoid compounds that have antioxidant properties. Particular flavonoids called flavonol glycosides also have been shown to have antibiotic effects. In several villages in West Africa where cholera (a disease triggered by activity of the bacteria called Vibrio cholera) epidemics had occurred, researchers added lime juice to the sauce eaten with rice and found that lime juice has a strong protective effect against cholera. Protection against inflammatory disorders: Benefits of lemons and lime is also attributed due to antioxidants like vitamin C and flavonoids. These can provide protection against inflammatory disorders like rheumatoid arthritis. According to a study of more than 20,000 subjects presented in the Annals of the Rheumatic Diseases, people who consumed the lowest amounts of vitamin C-rich foods were more than three times more likely to develop arthritis than those who consumed the highest amounts. Eye care: The antioxidant and anti-bacterial properties protect eyes from infections and mascular degeneration. In case of conjunctivitis, you can add few drops of warm lime-juice diluted with water. Which one is better? Limes or Lemons? Benefits of Lemon and lime may be same , but there are a few differences.A lime has denser flesh than a lemon which makes it heaver. But nutritionally speaking, lemons do not differ very much from limes. Both are excellent sources of vitamin C, B6, potassium and flavonoids. Lemons have more vitamin C than limes (around one-third more) but less vitamin A and iron. Add lime to your diet to gain all the health benefits of lemon and lime juice and to get that tangy, zesty flavor in your food. Instead of just drinking plain water with your meals, add a slice of lemon to your glass or squeeze some on your food instead to avail the benefits of lemon and lime . how can I loose weight my hands are too fat anything can I do to make it normal please advice. I’m from kerala. after pregnancy and delivery,my weight increased a lot,what should i do to decrease weight and also my tummy become very fatty, what can i do for that? Along with this, you need to spend atleast 1 hour doing physical activity of any sort to be able to tone up your body and regain the shape. one more doubt mam, which rice is more calorie less: basmati or brown rice? Brown rice cooked with vegetables is healthier than any other form of rice. We are from Bangalore, We need your Bangalore clinic details, in order to meet you in person, for weight loss management treatment. upto 2 cups in a day is no problem for you looking at your age. avoid excess of it. Hi, Am 29years , I take top tea to reduce my weight,, plz is it dangerous for me?? Nice info about lemon & lime…thanks. I have doubt regarding second point that you have mentioned, about digestion. If we consume lemon juice after meals, it may neutralize the stomach acid because lemon juice is alkaline, so if acids are neutralized then digestion may not happen properly… is it right ??? can you give me little info regarding this. . . .
basically lemon is acidic in nature untill it is metabolized completly in the body . and then it becomes alkaline . hence we ask our clients to tae lemon water even when they have acidity problem . having lemon on a regular base will keep the stomach acids low .. but when you are already facing an acidity issue , we do not give lemon , because after it is consumed it acts as acid for some time until it is metabolized . similarly … when the lemon water is still in its acid form in the stomach before it is metabolized , it aids digestion .. during digestion, it it self turns in to alkaline medium .. Thanks for the detailed explanation for my previous question. it was really helpful. My digestion was weak & stomach acids were low. But from last few days i’m having lemon juice after food, now my digestion is really good…. good to know it helped .. keep reading at Dietburrp ! hi,payal i am 24 year old girl,and my hip size is increasing with tummy ,what should i do? I would like to know tips for weight reduction and diet plan for a bachelor veg.